everytime I backwash and compress the sponge with the handle... do I lose my bacteria and need to put something in the water or does it all hand in there? Absolutely not. These bacteria are quite resilient. do backwashes as you please. There is a lot of controversy about the fragility of these bacteria. Just in general, they are overstated. So tonight I'm having my usual walk by the pond. The water is crystal clear and I can see all the way down (it's >1.5m deep), noticing all the rocks, and feeling good about the look of it. I see a few fish swimming in the pond lights (usually no more than 3 at a time... there are meant to be 26 in the pond) and so I'm getting a bit worried but not too much. After all it's freezing cold and I assume some might be hiding in the rocks waiting for the weather to warm up. until I spot a fish at the very bottom, on its back, moving a little bit its tail... I can't reach that far down so I'm trying to think how am I going to grab it down there... and I spot another one floating on the surface, barely moving and being dragged by the stream of the waterfall. I grab that one easily, put it in quarantine in the fishbowl we had from years ago (washed the bowl and filled it with pond water), and bring it inside. I notice that his pectoral fins are the only fins he's using. They are moving strongly, but the rest are not moving. More importantly the caudal fin is stiff. I assume this is due to the freezing cold (it's 10C in the water) so I take half the water in a large bowl, microwave it for 1 minute, stir it and refill the tank, slowly the water rise to 11 then 12C and after an hour to 15C. The rainbow seems to be getting better, balancing its buoyancy a little better, and starting to flip its tail. So I leave him overnight in the kitchen to see if warmth is the cure. This morning the fish is still alive but very poorly. I then spot what I believe is fungus! Did I diagnose this correctly? How can fungus spread so quickly, I only introduced the fish a week ago, and started feeding then (I read that overfeeding could help fungus). What can I do to save the fish, and more importantly how do I treat 7k litres of water in the pond? Last edited by GreyhoundOz; 25-08-16 at 08:47 AM. A quick check of the water parameters and post the results would be helpful. Fish sometimes go into slime production overload to protect themselves from harsh conditions. Could it be that? Will leave this up to someone more experienced. Sorry I didn't run one last night, on the 17th (page 2 of this thread) I did a complete test and everything was dandy. I acknowledge that things might change overnight so will run a new test tonight. Stress: absolutely - fish got introduced to the pond and it's REALLY cold this week (I check daily and the pond thermometer oscillated between 10 and 12C). It depends whether they are warm water or cold water rainbows yes?? I have no idea how to treat such a huge water volume.... Maybe you should round them up and treat in a smaller tank. Just use a broad spectrum treatment until you get better advice. Fish disease is so difficult I find. The fungus could be a consequence rather than cause. Next time, get some rainbows from Grubs (he's got other kool stuff as well; just take lots of beer/home made wine or a fig tree to swap) so you know that they will tolerate the freezing cold of Melbourne. Melanotaenia fluviatilis is the most southerly ranging rainbowfish in Australia and is the only species adapted to low winter temperature (normally around 10 to 15° Celsius). However, there is some evidence that numbers are seriously reduced during winter periods, when water temperatures drop below 10° Celsius. Southern populations can survive a few days at 7°C, but are susceptible to bacterial and protozoan infection at these temperatures. The Barcoo River Rainbow is from the Barcoo river in Central Australia. These fish inhabit one of the most unhospitable riverine environments in the world. Water temperatures vary wildly through-out the year. Overnight low can be about 12 Celsius in summer with a daytime high in the 40s. In winter overnight lows can be below freezing, while the next day can be in the comfortable 20s (Celsius). General water quality is also under pressure as the flow of freshwater is infrequent to say the least. This means, these rainbows make a very hardy aquarium fish. Able to suffer the consequences of the casual inexperienced fish keeper. A heater is not required under normal conditions for an indoor aquarium. That was the fish I was hoping would survive the cold water best. In my last house I put a few Murray rainbows bought from the LFS into smallish (500-600litre?) pond in the back yard and lost several of them over winter which I put to it just being too cold. They lost all their colouration and condition deteriorated and they looked much like yours ^ I ended up netting them out and putting them in a tank inside. The fish from Livefish are bred in QLD at AussyFish and the breeding stock would be well used to warmer water. 3) grew big and fat over summer so they had plenty of fat reserves going into winter. If/when they breed again this spring I'll grow out a bunch of fry as a few forum members have expressed an interest in getting some. Last edited by Grubs; 29-08-16 at 12:24 PM. How do I source the "right" fish? I haven't found any native fish store in Victoria. happy to make a longer trip there, or pay more to avoid putting non-native like goldfish. I need to find stock that eat insects before my pond becomes mosquito central. Quick update in case anyone finds this thread. 1) some rainbows survived the harsh and cold winter. not many but I have spotted at least 3 swimming at about 80cm depth this weekend. They stay together but I can't identify which species they belong to. They seemed to have grown as I don't remember them being so big. 2) I added 30 white clouds which have completely eliminated the mosquito larvae - I feel dirty for using those non-natives but they have done an amazing job. They are so small they can actually swim between the rocks and hunt down any insects hiding in the darkest part of the pond. If I could get a stable school of rainbows I'd gladly get rid of them but I can't figure out a way to selectively take out some fishes. The pond has too many places to hide. 4) Shrimps have survived. Every now and again at night I can see the distinctive shape and swim of the larger ones in the pond lights. 5) weeds. Come and go, the only trouble is the candy-floss type which I eliminate with a giant cob-web brush I bought at bunnings. It's a dirty job which I hope I won't have to do as often once the plants have grown. 6) snails. I picked up plants from an aquarium place which must have had snail eggs and now the pond is covered in them. These little monsters have spread very very fast, and I still don't know if they are helping or a nuisance. They clearly chew on some plants but at the same time they also spend all day zigzagging on the rocks and I assume eating alguae. a) loaches: I can't find any that will withstand the cold. b) copper: I am not confident I have the exact volume of my pond sorted to risk overdosing. Copper sulfate for the snails. Be prepared for any ammonia spikes though. All your shrimp will also suffer/die. What type of snails are they?? [ I dislike snails so please note that I am biased ]. Sounds like you are getting well versed with pond life!! Nice. they are black small and don't come with a registration plate so I had to google image freshwater snails. most are pitch black the largest of a lighter dark brown to brown colour. eggs are a gooey translucent bag the maybe 1 cm long with dots inside. Last edited by GreyhoundOz; 17-10-16 at 11:28 AM. consider permanent snail traps. weighted and tied with string/rope so you can pull them out at will. just the right size for the snails. to start with - bait and remove every day or two - and shrimp / small fish will scramble out as you pull them up. whatever is left wont hurt your environment. snail jello will attract the snail more than any other critters in to the traps. thanks - that sounds good, but each snail is leaving 100s of eggs behind them every day. 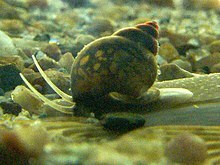 When i first found 3-4 snails I put them in a separate old fish tanks for the kids to see - learn. Within a week the place was literally covered in eggs. I'm wondering if I'm fighting an uphill battle taking a few snails out every day. I'll give it ago. At the moment I'm picking maybe 10-20 everytime I walk by the ponds (they are black on cream rocks - easy to spot) and by the time I walk by the pond again one hour later I can already see more. Time to enroll the kids into it too! Maybe if I put a few weather loach in this summer they can fatten up and eat the lot before winter? Last edited by GreyhoundOz; 17-10-16 at 11:29 AM. .. don't look like the picture you posted.. but you made me look you dirty chook .... and now I realise I have these in my pond too. Reading up on them they are an introduced pest that carries liver fluke of sheep and cattle.... so now I'll start flicking them onto the garden! I'll take pics of mine (the photo I posted was from google image) fairly sure I have the yankee snails. I have taken out 30 snails in 5 minutes on Monday and 25 on Tuesday. No need for traps at this stage they are all in plain sight.